Choose a subtle stripe or go bold with our classic striped carpet range. Our collection of colourfully striped carpets is popular for bedrooms and stairs. A striped runner gives maximum impact to a hallway that has wooden or laminate flooring. Stripes provide a bright, cheerful look to your bedrooms. Combining natural earth colours gives a subtle traditional look. Striking colours and textures are contemporary and fashionable. Choose the best of British craftsmanship to complement your home, and you will have a new carpet that stands out for all the right reasons. The quality and durability of striped carpets are suitable for both residential use and commercial carpeting. Available in 7 colours and in 4m width, our standard striped carpet range works well in every interior space. If you can’t find what you are looking for in our standard range, then consider asking for a bespoke quotation. We can work with you to create bespoke striped carpet in the colours of your choice and the stripe pattern of your making. Choose your striped carpet and carpet fitter from an experienced team. Quality fitting of a striped carpet is important. 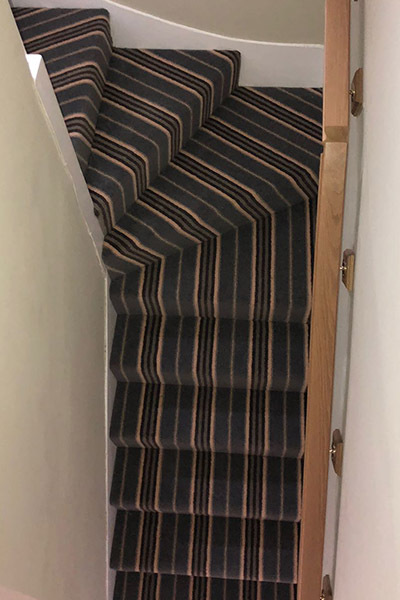 The centre line in the stripe must line up on each step to give the appearance of the stripes lining up when you look up or down the stairs. Stripes vary in width and pattern repeat. Ask for our help to get the right carpet and the right finish. Jorgus Carpets have manufactured striped carpets for over 30 years using the most beautiful quality wool blend yarns. For details about our striped carpet construction, wool content, finished weight, suitability, backing, tog rating, colour fastness, shampoo options and British Standards certificates, please ask. We can provide all the product options for you. Commercial and domestic customers are all welcome to browse the quality of our full range at our factory outlet showroom. 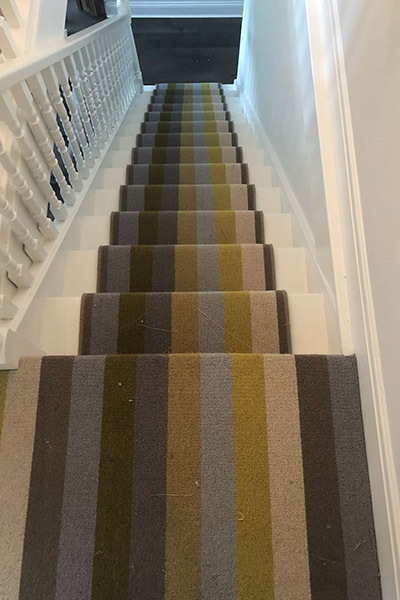 For more information about our striped carpet range and/or pricing for a bespoke option please contact us on 01257 482636 or fill in our Contact Form.